John was born in Liverpool, England, in 1955. After a conventional high school education he graduated in Chemistry from the University of Nottingham in 1976. John remained at Nottingham to do postgraduate work and in 1980 recieved a PhD for a thesis entitled the "Hydrogen-Deuterium exchange reaction on Platinum-Rhodium alloys". During his time at Nottingham, John was president of the astronomy society and learned to fly gliders with the Buckminster Gliding Club. After graduating, John spent three years as a Flight Test Engineer with British Aerospace at Warton in Lancashire where he worked on the aerodynamics and avionics of the Tornado ADV fighter version of the Multi-Role Combat Aircraft (MRCA). In 1981 John was awarded the N.E.Rowe medal of the Royal Aeronautical Society for a paper entitled "Possible Future Developments of the Space Shuttle". Away from work, John continued to fly gliders and spot planes for fun. For "relaxation" he began a part time PhD in astronomy at Preston Polytechnic, working with Dr Doug Whittet on "Photometric Monitoring of Early Type Emission Line stars". Three jobs, a marriage and three children later, he graduated with this degree in 1988. Tornado ADV with wings fully swept. In 1982, having decided astronomy was more fun than flight testing, John left British Aerospace and joined the astronomy department of Leicester University where he worked with a small group of solar system astronomers. John, with then PhD student Simon Green, searched data from the Infrared Astronomical Satellite (IRAS) for moving objects. This led to the discovery of 6 new comets, a hitherto unknown dust trail associated with comet P/Tempel-2 and several asteroids including 3200 Phaethon (the source of the Geminid meteors). When the IRAS mission ended, John stayed at Leicester for a while helping in the UK preparations to observe Halley's comet before moving, in 1984, to the Space Research department of Birmingham University. At Birmingham he helped with the testing of the Wide Field Camera, a British soft X-ray telescope carried on the German/US/UK ROSAT astronomy satellite. The ROSAT launch was delayed by the explosion of the Space Shuttle "Challenger" in 1986, but it eventually went on to make a very important survey of the sky at X-ray wavelengths. John moved to the Royal Observatory in Edinburgh (ROE) in 1987 and joined the international team building ISOCAM, the Infrared Camera for the European Infrared Space Observatory satellite. At ROE John was responsible for a cyrogenic (ultra-low temperature) test facilty used to verify the performance of the optics for ISOCAM and was eventually made a member of the ISOCAM science team. As the ISOCAM test programme ended, John joined the group at ROE responsible for the support of UKIRT, the UK Infrared Telescope atop the 14,000ft high dormant volcano Mauna Kea in Hawaii. John was responsible for the UKIRT "service observing" programme which makes short observations for a variety of small projects, none of which require the award of a whole night of telescope time. He still liked spotting planes. In 1993 John and his family moved to Hilo, Hawaii and John joined the team of astronomers at the Joint Astronomy Centre supporting UKIRT. As a "support scientist" John assisted astronomers who come to use the telescope and, from 1996 to 2001, he was also responsible for setting the telescope schedule. Like the other UKIRT scientists, he made frequent trips up to the telescope to support visiting astronomers during their first night at the telescope. 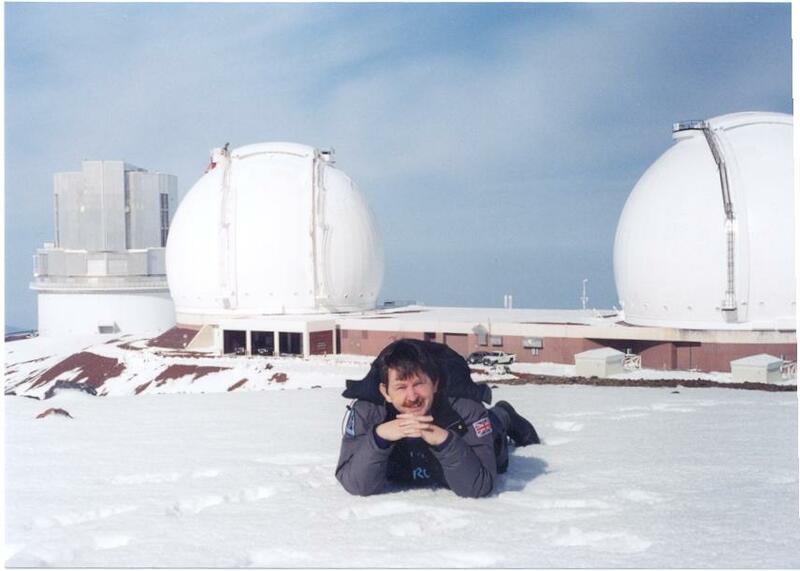 Sometimes he also went up in the daytime, here he is outside the Subaru and Keck telescopes one snowy morning in 2001. When this picture was taken he was involved in a comet observing project at the NASA infra-red telescope. This project required long wavelength observations and so could be carried out during the day. John's personal research involves small solar system objects such as comets and asteroids. For this he uses both UKIRT and other telescopes including the James Clerk Maxwell Telescope in Hawaii and optical telescopes on La Palma, in the Canary Islands. In 2000 a small main belt asteroid, Minor Planet 9064, was named after him. Two pictures I took of 'myself' recently combined into a 'blink' in which the asteroid, just about in the middle, moves but the stars remain fixed. The two images are about 30 minutes apart, and each is 60sec of exposure. The blue backgound is fake, although it was not long after twilight which is why the star images seem to flash a little, the image quality was improving as the sky got darker. Thx to Jason for helping with the 'blink' effect. 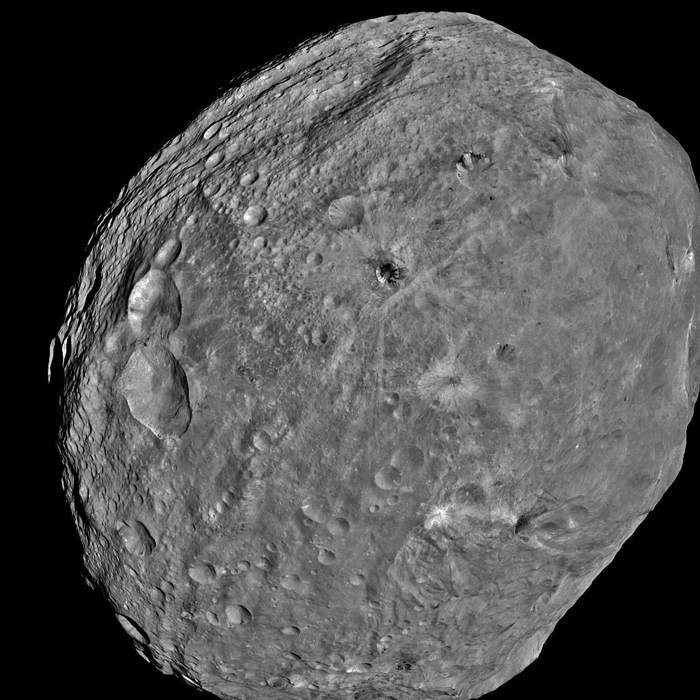 Probably about 6km across, 9064 JohnDavies was detected in the Sloan Digital Sky Survey and is classified as a V type, perhaps a fragment of the much larger asteroid Vesta seen here in a photo taken by the NASA 'Dawn' mission. He maintained his interests in planes! 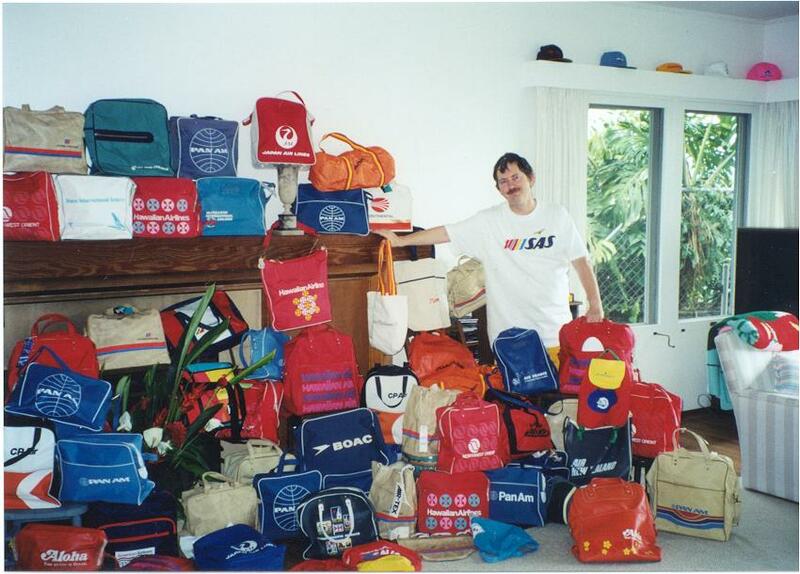 This is his collection of airline carry-on bags. In 2001 John returned to Edinburgh, to become Project Scientist for the European OPTICON project, an EC sponsored activity aimed at integrating all of European astronomers. OPTICON is a huge step in developing European astronomy and hopes to help pave the way for a European 'Super telescope' with a mirror 100m in diameter. The OPTICON project requires a lot of meetings and travel around Europe and allows him to continue to indulge his interests in planes. 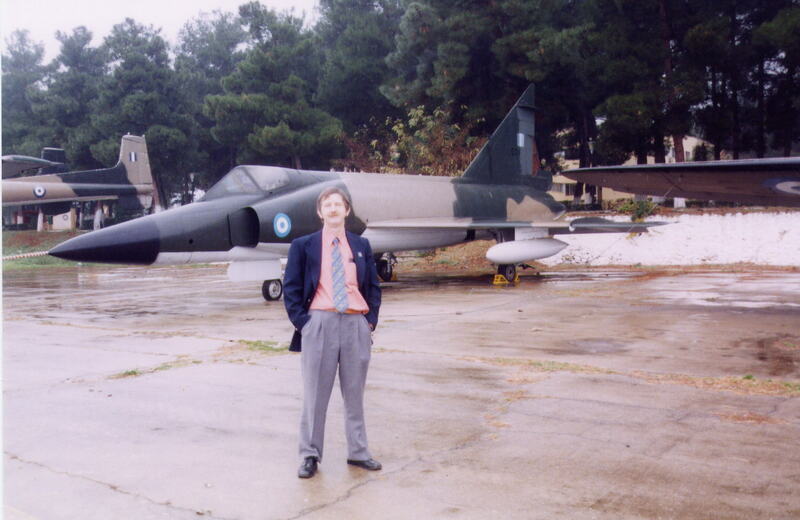 Plane Spotting in Greece, November 2003. He also continues to try and convince people that science is fun. 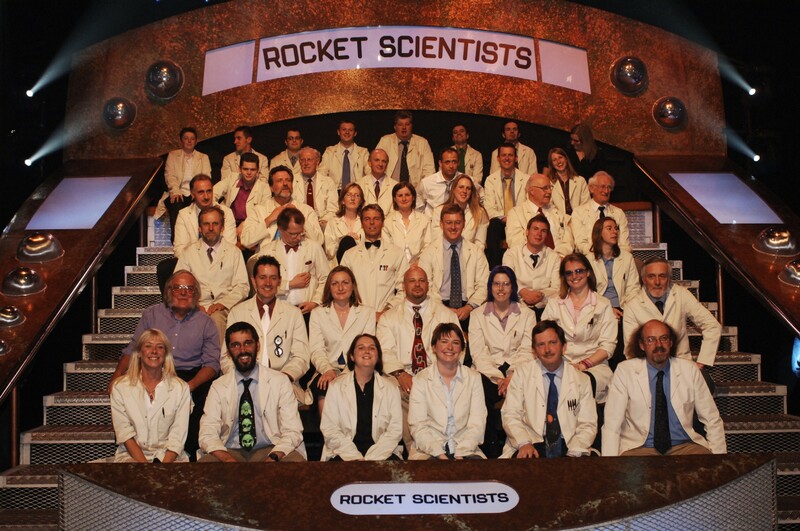 Here he is, second from right on the front row (where else?) in a 'Test the Nation' TV quiz. He also took place in the Sky at night episode to celebrate the 40th anniversary of the moon landing. 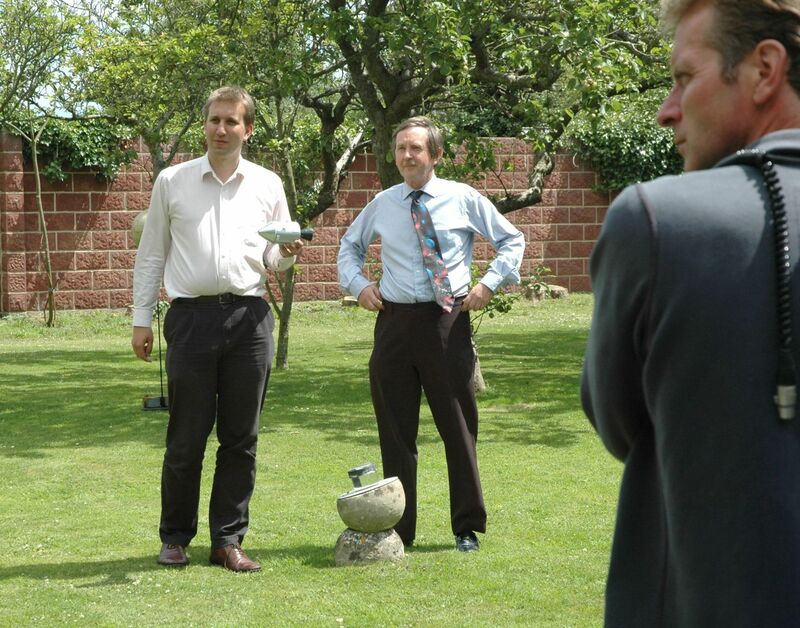 Here he and Chris Lintott fly an Apollo CSM across Patrick Moore's back garden. John went into 'partial retirement' in 2015 but still works about 3 days a week at the observatory. As well as his OPTICON and outreach roles he took part in the campaign to observe comet Cheryumov-Gerasimenko which was the target of the ESA Rosetta mission. Recently he has participated in a few, so far unsucessful, proposals for a new European asteroid mision. He remains active in another 'ATC', the Air Training Corps, being an instructor at 869 (Penicuik) Squadron. About to go inverted in a Grob Tutor, about 5000ft above Leuchars in Fife. To find details of John's research programmes, publications and so on, go back to the home page and explore the pages on Science, Technology and Writing.